Botai has two R1b1a1 now. So it may happen than TU45 = BOT14, BKZ001 = BOT2016. In any case, it's interesting to see on the map that faint east to west trail of R1b-M343 (xM269) from the Urals to western Finland. That might have something to do with the early migration of Uralics to the East Baltic. I'm not saying that Botai people were Proto-Uralic-speakers, but they or closely related groups similar to West_Siberia_N, may have had contacts with them. Jaakko Haakinen believes that the ancestor language to Proto-Uralic was originally from east of the Urals, based on similarities shared with more eastern languages like Yukaghir and the Altaic group that must have occurred before the breakup of PU. This R1b Y haplo distribution might lend support to that theory. Yes, he posted about that at this blog once or twice. Regardless of R1b-M343 the N-M231 branch found in BOT15 is Y6503 or N2* which is highly divergent from all other N. It likely has nothing to do with Uralic expansion at all. Y6503+ is now found only in the Balkans. 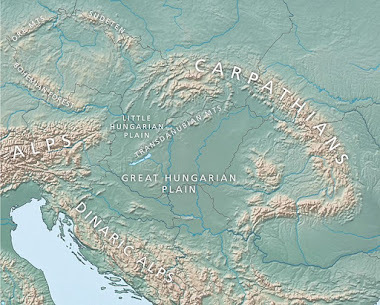 It was found in the Pre-Scythian Ir1 from Hungary. 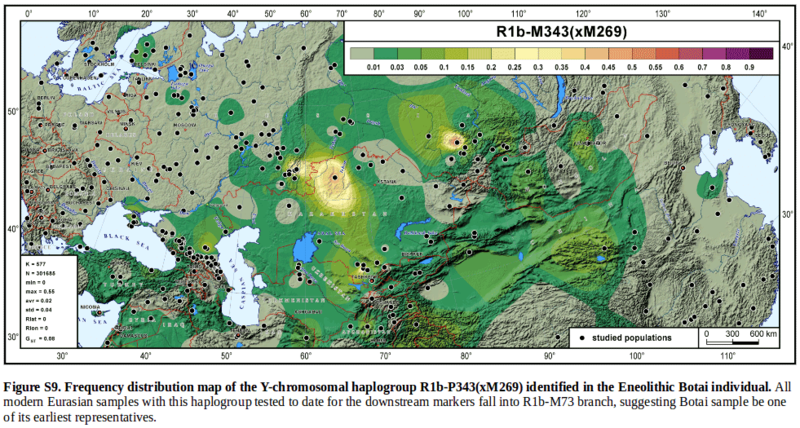 Does this point to a Pre-Mesolithic/Pre-Epi-Paleolithic Migration of Haplogroup R from East of the Urals taking a Northern Route into Europe with occasional Southward Pushes after +-18 000 YBP ? So Haplogroup R didn't migrate through Southern Central Asia to Europe ? What Haplogroups or proposed Macro-Haplogroup can be most closely linked to ANE currently ? It obviously wasn't an important lineage in the Proto-Uralic expansion, but it may have been present in the Proto-Uralic population. So Haplogroup R didn't migrate through Southern Central Asia to Europe? I'm pretty sure it moved into Europe via Siberia while it was still home to overwhelmingly Ancient North Eurasian (ANE) populations. Troll post by Algan mardi removed. He/she was claiming that there was no steppe ancestry in Bronze Age Greece or the Balkans, when in fact there is. I can make a mistake but it does not make me a troll, the basic is said. Is your censorship science or dogma? You rambled a bunch of nonsense about no steppe ancestry in ancient Greece and the Balkans. And you claimed that the ancient Anatolian samples were Hittites, when they're just Hittite-era, and probably Hattians or Hurrians. If you really believe that they are Hittites, that's fine, but keep in mind that there's no evidence of this in the paper. At least attempt to get the basics right and be objective when you post here. It's not too much to ask. That's not the consensus, for many good reasons. I not claimed that the ancient Anatolian samples were Hittites. the authors of the paper did. I not claimed that the ancient Anatolian samples were Hittites. The authors of the paper did. No they didn't. They classified them by historical period and location. Three of these samples were from the Assyrian colonies period, and two from the Old Hittite period. But no one knows who they were, and if they were Hittites, Hattians, Hurrians or Assyrians. By the way, quit spamming my blog comments. Probably R. Between now and 24,000 ybp there have been gradual inputs that have created EHG and so forth. R1 is probably a better fit to EHG though. It would be interesting to see some ancient R1b(xL754) from Asia, although those might turn out like Botai, somewehere between EHG and ANE. Thanks. So was Ust Ishim Man before ANE formation then ? @Hern. Much older than ANE. AnE or beringia populations split from east asia about 25k years ago. Can someone explain who these Botai people are, and what their relationship with other groups would be? All I can understand is that they are West Siberian HG descendants of ANE, but not the same ANE that mixed with WHG to make EHG... is this correct? Botai are like Neolithic West Siberian HG's but a bit more Baikal HG-shifted (can be modeled as WSHG+ShamankaEN). The actual Neolithic WSHG's are close to the ANE in EHG's - maybe closer than anything else found so far - since modeling EHG's as WSHG+WHG using qpAdm works quite well. Thanks! What do we know of these Baikal HG and their relationship to WSHG? Damgaard et al. suggested they were a previously unknown isolated East Eurasian population that separated from the Han branch post-LGM but that may not be the full picture, they appear to have some ANE (Daur+AG3 works in qpAdm) which wasn't tested in the paper. That eastern admixture is what excludes them as the source of WSHG in South Asians, correct? Baikal HG is quite similar to certain modern Tungusic peoples, I don't think anyone has even suggested any direct admixture in South Asia. WSHG and maybe Botai are another matter. Narasimhan says WSHG was present back in Indus_Periphery. Botai gives the strongest ANE-related f3 signal in Iron Age Swat but they didn't use it in any other tests in that preprint. @Davidski, do you think it will be possible for you to calculate Fst scores with any of the new samples from the Damgaard papers in particular? And a set of populations similar to the last matrix you provided (though ideally with Ulchi as well and really ideally more world populations). I'd like to try and put them through the Fst PCoA and some other forms of analysis, to see if any of them are extreme in drift beyond present day populations, especially the Shamanka_EN / BA, Okunevo and Botai. The early tweets on the Shamanka_EN described them as very homogenous, so I'd like to see if they are homogenous (and drifted) beyond present day East Eurasian populations, as indicated by a particularly high Fst against outgroups.